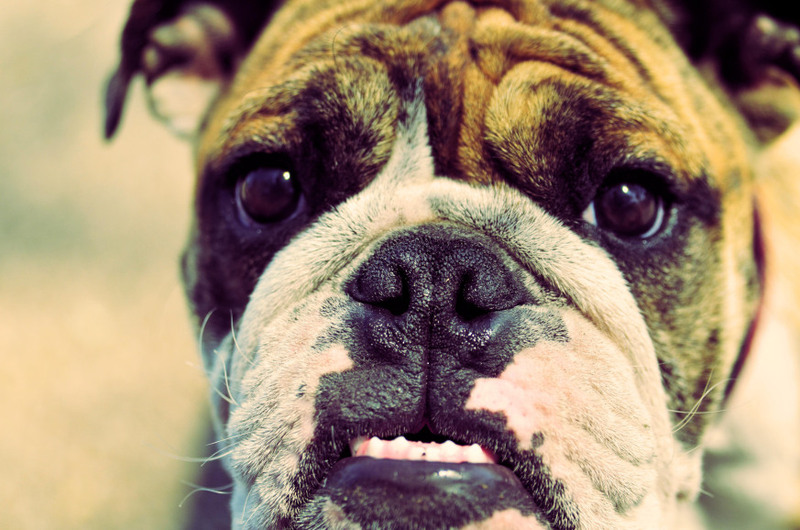 This article will help you identify ailments that could afflict your bulldog’s eyes. Eye problems in bulldogs are serious business. If you even suspect that your bully’s eyes are bothering him, you should respond quickly because good vision is essential to your bulldog’s quality of life. In some cases, delaying treatment could result in permanent eye damage or even blindness. Cherry eye is probably the most common bulldog eye problem, and it typically only occurs in young dogs. If you see a red, irritated mass of fleshy tissue protruding from the inside corner of one or both of your bully’s eyes, your dog may have cherry eye. 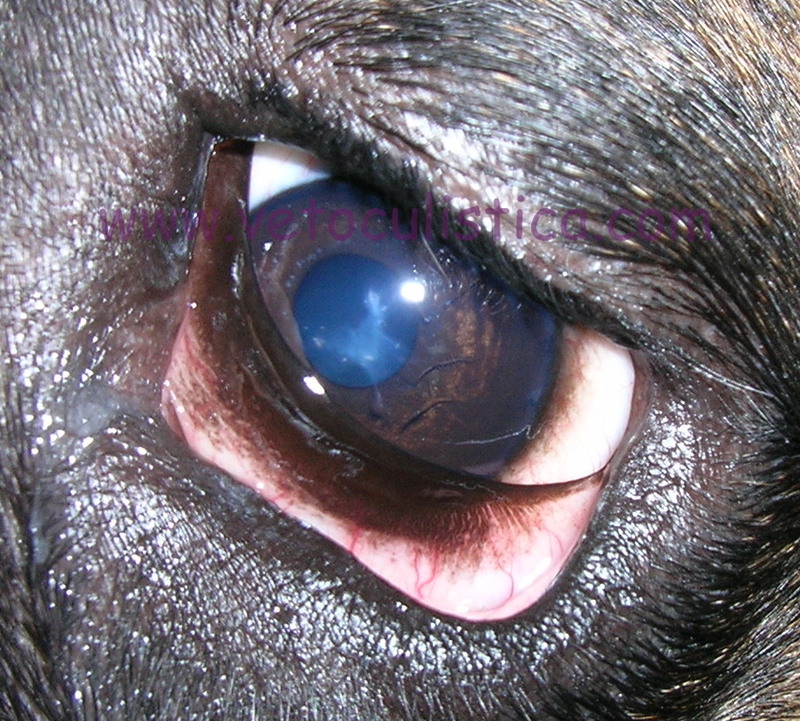 Cherry eye is a condition involving the prolapsed gland of your bulldog’s third eyelid. Other possible symptoms include excessive tearing, discharge, or draining from the eye. 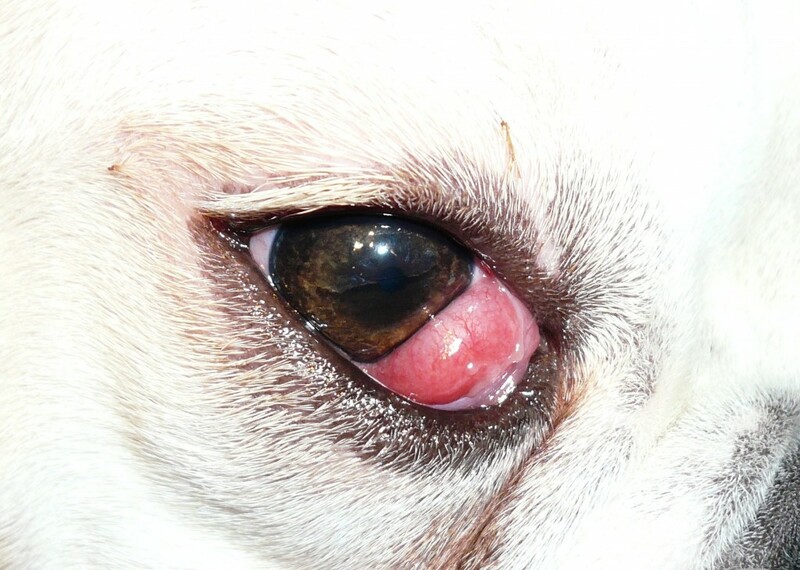 Cherry eye is likely caused by weak connective tissue, eye trauma, or horseplay. The good news is that cherry eye is usually not painful, and it’s never life-threatening. The bad news is that if cherry eye is not treated properly, it can lead to more serious eye complications. Cherry eye is not an emergency, but it should be treated as soon as possible to lessen your bully’s risk for future problems. Some bully owners attempt to treat cherry eye at home by massaging the protruding gland back into place, but an experienced veterinarian is your best option for successfully resolving cherry eye. 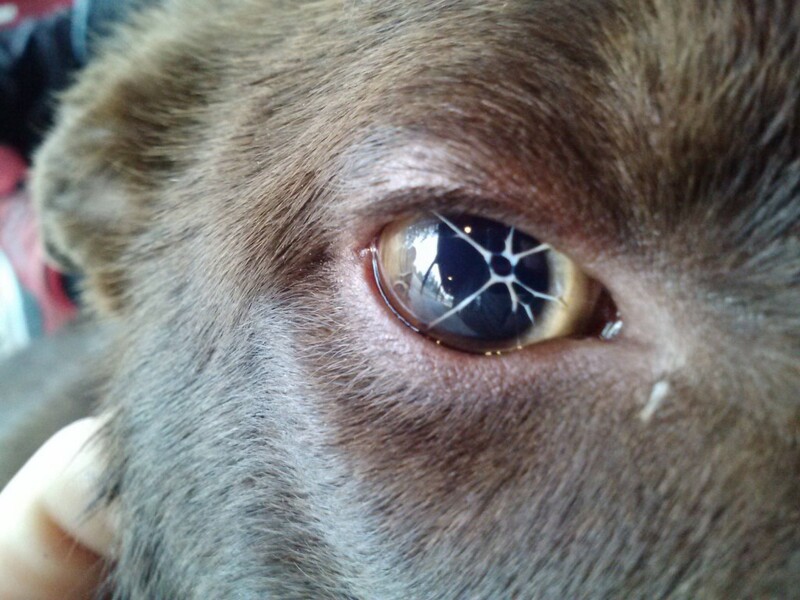 Vets have two treatment options for cherry eye. One is to suture the gland back into place, and the other is to surgically remove the gland completely. If you choose to have your vet suture the gland, you should be aware that the gland may pop back out of place and require additional treatment. Surgical gland removal will prevent future incidents of cherry eye, but it could lead to more serious complications. That’s because the gland involved in cherry eye is responsible for most of your bully’s tear production. Removal of the gland could cause your bully to develop dry eye, which is a much more serious condition than cherry eye. The medical term for dry eye is keratoconjunctivitis or KCS, and the term means inflammation of the cornea and surrounding tissues from drying. That’s just a fancy way of saying that your dog doesn’t make enough tears. If your bulldog is not making enough tears, his body will try to compensate by making thick, yellow or green mucus that will discharge from his eyes. You may also notice your bully squinting, excessively blinking, or holding his eyes shut. Your bully’s eyes may be red and irritated, and your bully may be in pain. Dry eye most commonly occurs in middle aged or older bulldogs. It usually affects both eyes, but one eye may appear to be worse than the other. Dry eye may be the result of cherry eye removal; it may be a congenital defect, or it may be caused by disease or medication. There is no cure for dry eye, and if it is left untreated, it could result in the loss of normal eye functions. Management of dry eye is a daily, lifetime commitment, and it involves the use of eye drops or ointment. Some of the eye medications are used to stimulate tear production, while others are used to provide lubrication to the eye. The treatment of dry eye always requires a veterinarian, and any deviation from the treatment protocol can lead to permanent eye damage. Corneal ulcers are one of the most serious eye problems that any dog can experience, and Frenchies in particular are at risk for them. Ulcerative keratitis is the medical term for corneal ulcers. They are incredibly painful and require urgent veterinarian care as failure to receive timely treatment can result in blindness or losing an eye completely. A bully with a corneal ulcer will most likely try to relieve his pain by rubbing the affected eye with his paw or on the carpet. He may close his eyes tightly, and he may have eye discharge. One common cause of corneal ulcers is eye trauma, which may be the result of rubbing, a cat scratch, or contact with a sharp object. Corneal ulcers are also commonly caused by chemical burns that occur when a bully gets soap or shampoo in his eyes. Bully owners must take every possible precaution to protect their bulldogs’ eyes from shampoo exposure during bathing. Other causes of corneal ulcers include untreated dry eye, infection, and disease. Treatment of corneal ulcers depends on how deep an ulcer has penetrated, and it always includes antibiotics that require frequent applications. Treatment sometimes includes medications for pain and inflammation, and corneal ulcers may take several weeks to heal. The most severe corneal ulcers will likely require surgical intervention. No one wants his beloved bully to suffer pain or vision loss. Unfortunately, something as simple as a scratched eye or dog shampoo can cause eye problems that could jeopardize your bully’s health. Recognizing the signs and symptoms of eye conditions are the best way to protect your bully’s vision. You should always take any signs of eye discomfort seriously, and if you have any doubt about your bully’s eye symptoms, call your vet immediately. The most important thing to remember when dealing with your bully’s eyes is that any problem can become seriously quickly, and you should always contact your vet at the first sign of problems. Here are some of the ailments that could affect your bulldog’s eyelids and eyelashes. The two words that best describe this eyelid problem are ABSOLUTE TORTURE. Entropion is a genetic problem that will hit your bully very suddenly, and bulldogs with droopy eyelids are more likely to suffer from this painful and irritating condition. Entropion occurs when the eyelid rolls inward toward the eye, and then the eyelashes scratch the eye every time your bully blinks. If left untreated, entropion can cause eye scarring, infection, and blindness. The first signs that your bully is suffering from entropion are tearing, eye rubbing, bloodshot eyes, and/or a milky cloud that develops over part or all of the eye. If entropion persists and your bully’s eyelashes scratch his eye for a prolonged period of time, the blood vessels in his eye will bulge, and his cornea may appear to protrude or bulge from his eye. Entropion requires an immediate trip to the vet, and until you and your bully arrive at the vet’s office, you should use eye lubricant to protect against eye damage. In order to treat your bully for entropion, your vet will perform surgery in which he removes the problem eyelashes. The good news is that the surgery is almost always successful the first time, and after surgery, your bully will be able to blink smoothly without pain. 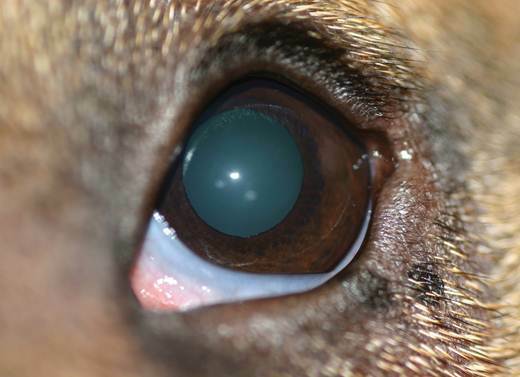 Your vet may prescribe some steroid eye drops after surgery to help reduce swelling. Ectropion is another eye problem associated with the genetic trait of droopy eyelids, and it usually affects both eyes. Bulldogs that are under one year of age are the most common victims of this illness, and they develop the problem when their lower eyelids sag or roll outward. The problem with ectropion is that it causes the delicate tissues that line the inner surface of the lower eyelids and cover the eyeball to become exposed. The drying of tissues that occurs with ectropion can cause pinkeye, corneal inflammation, and corneal ulcers, all of which are very painful. Corneal inflammation and corneal ulcers can lead to scarring, which can cause permanent vision loss. If your bully has ectropion, you will notice a severe sagging of his bottom eyelids, and you will probably see a thick, slimy discharge along the inside of the bottom eyelids. 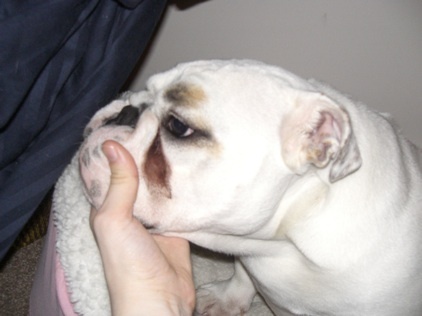 Your bully’s eyes may appear red or swollen, and your bully may paw at his eyes. You may also notice tearing from the inside corners of your bully’s eyes, and the tearing will cause brown stains under his eyes. 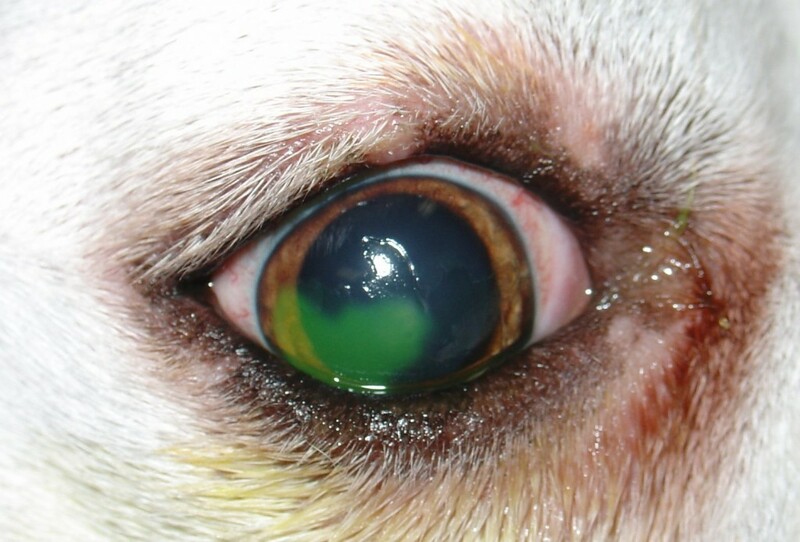 As with all bully eye conditions, ectropion requires treatment from a vet. If your bully’s ectropion is not very severe, you will treat it with lubricating eye drops or ointment, as well as antibiotic eye drops. Unfortunately, the worst cases of ectropion require surgery in order to correct the sagging eyelids. Most cases of ectropion can be successfully treated, but your bully may require eye drops for his entire life. Several eye problems that may affect your bully are genetic and involve abnormal eyelashes. Distichiasis is a condition that occurs when the eyelashes grow in an abnormal location on the eyelid, or they grow in an abnormal direction. Sometimes, a bulldog may grow an entire extra row of eyelashes. Even though bulldogs don’t normally grow eyelashes on their lower eyelids, distichiasis can affect the upper or the lower eyelids, and it usually affects both eyes. With distichiasis, the eyelashes are usually short and tucked deep into the eye socket behind the eyelid. Distichiasis is often very painful, and your bully may feel like he has needles poking him in the eye. The symptoms of distichiasis are the same as those for entropion, and you will need to take your bully to the vet for diagnosis and treatment. 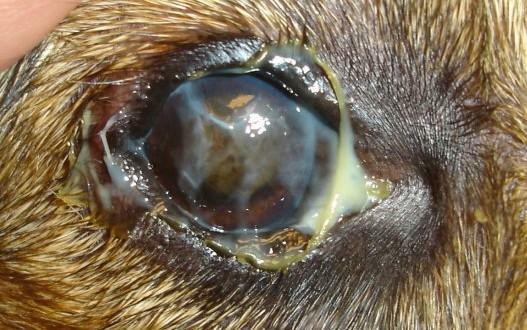 Treatment for distichiasis depends on the severity of the problem, and sometimes it only requires eye lubricant. If your bully’s abnormal eyelashes are damaging his corneas, he may require surgery to permanently remove the problem eyelashes and their follicles. Ectopic Cilia are eyelashes that grow through the mucous membrane that lines the inside of the eyelid, and they cause intense pain. Most commonly occurring on the upper middle eyelid, ectopic cilia rub against the cornea and can cause dangerous corneal ulcers. If your bully has ectopic cilia, his eyes will be red and swollen, and he will have excessive tearing and eye discharge. Your bully may rub his eyes, and he will probably hold his eyes tightly closed and blink uncontrollably. Ectopic cilia must be surgically removed, and most surgeries are successful. However, your bully may develop additional ectopic cilia later in life and again require surgery. Trichiasis is a condition in which the eyelashes grow inward toward the eyeball. If your bully has trichiasis, you may notice swollen eyes, excessive tearing, eye twitching, and a pigment change in the colored portion of his eye. Mild cases of trichiasis are controlled by trimming the problem eyelashes, while more severe cases require surgery to permanently remove the eyelashes. Unfortunately, some bulldogs inherit eyelid and eyelash problems that may threaten their eyesight. Like all eye problems, these conditions require veterinary treatment, and using a vet that is experienced with bulldog care is especially helpful when dealing with genetic problems. The good news is that you can avoid permanent damage by seeking help at the first sign of trouble. The conditions covered below are usually less serious than the previously discussed ailments. Before your bully was born, he had a membrane that nourished the lenses of his eyes. 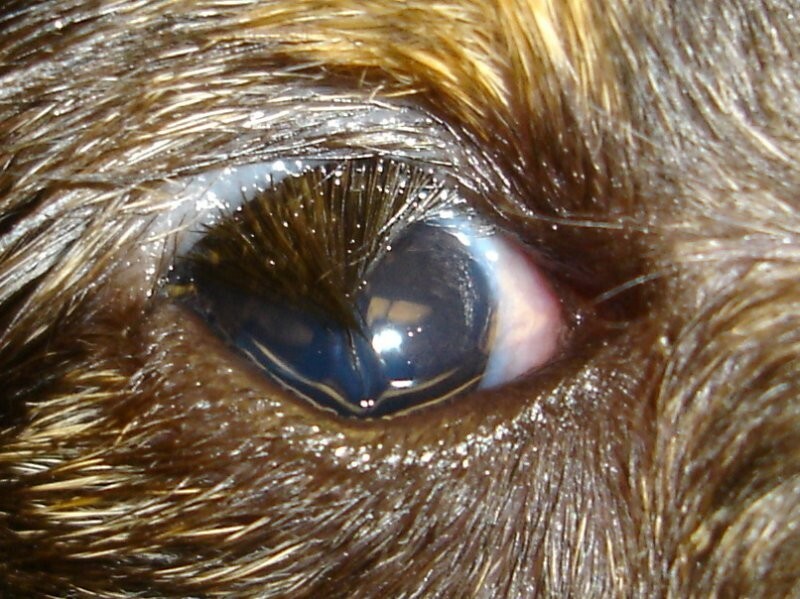 PPM occurs when strands of the membrane remain on a puppy’s eyes after he is born, and it is an inherited condition. The problem only occurs in puppies, and often the strands break down on their own by 8 weeks of age. However, strands that persist can cause vision problems. White spots on your puppy’s eyes and impaired vision are signs that your pup may have PPM and will need veterinary treatment. Strands that are attached to the cornea or lens can cause swelling, or clouding of the cornea. PPM can also cause cataracts. Medicated eye drops are enough to resolve most cases of PPM, but if your puppy develops extensive cataracts, he may need surgery. Pinkeye, or conjunctivitis as your vet may call it, is an itchy inflammation of the tissue that coats the eye. Pinkeye also occurs in humans, and bulldogs can develop pinkeye at any age. Eye irritation, allergies, or a more serious eye disease can cause pinkeye. Eye redness, puffy eyelids, and stringy eye discharge are some of the symptoms of pinkeye. Other symptoms include watery eyes, squinting, eyelids that stick together, and pawing at the eyes. Even though pinkeye is often not serious, you need to take your bully to the vet right away if he develops any of these symptoms in case he has a more dangerous eye problem. Most cases of pinkeye are healed easily and quickly by medicated eye drops. Tear stains are most noticeable on light colored or heavily wrinkled dogs, and they are a common problem in bulldogs. The cause of tears stains is simple; it’s the overflowing of tears from your bully’s eyes. For the most part, the only problem with tear stains is that they look bad, but occasionally they can be more troublesome. Sometimes the constant moisture associated with tear stains can become a breeding ground for bacteria and yeast. In other cases, tear stains may indicate that your bully has a serious eye problem that is blocking, inflaming, or infecting his tear ducts. If you notice that your bully’s eyes are itchy or sensitive, or that his tear stains have an offensive odor, you should take him to the vet to see if the stains are more than a cosmetic problem. In healthy bulldogs, treating tear stains may be a part of your normal care routine, and it involves two steps. You have to clean the tear stains, but you also have to determine what’s causing them so that you can treat the source of the problem. Pet supply stores offer a variety of products that are specifically made for cleaning tear stains, and many homemade remedies work well too. Applying a 50/50 solution of hydrogen peroxide and water with a cotton swab is one option, but regardless of the cleanser you choose, you should always be sure that none of it gets in your bully’s eyes. 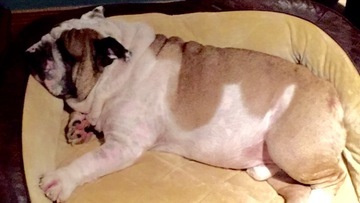 Drying after cleaning is also important, and applying talcum powder to your bully’s wrinkles will help keep him dry. Sometimes, allergies are the cause of tear stains, and choosing a dog food with no artificial additives and preservatives may alleviate your bully’s tearing problem. In other cases, changing your bully’s pH will help prevent tear stains, and you can achieve this by feeding him ½ of a fruit flavored antacid twice daily or adding a teaspoon of vinegar to his drinking water. However, some bulldogs won’t drink water that has been treated with vinegar, so you need to make sure that your bully’s water intake does not decrease. Protecting your bully’s vision is important to his quality of life and overall health. Many eye problems can become serious and cause permanent damage quickly, so you should always contact your vet if you suspect your bully is having any eye discomfort. Almost all eye problems are curable with the proper treatment, and your bully will be happier and healthier when his vision is good and his eyes are pain-free. This article is dedicated to Brutus, our beloved OEB and most popular family member for 8 years. Bubba, we will love you and miss you always.